Until you mentioned it, it never occurred to me that there might have been any "active" spirituality in the altar. I always saw him as being a little cocksure in his ability to estimate the correct weight, which resulted in a purely mechanical response from the trap. And after thinking on it, if the Abrahamic god exists (see climax) then the Inca gods do not. This may seem like nitpicking, but I don't believe you can pin that particular failure on a lack of spirituality. I love this blog by the way, you're awesome. Thanks! I don't think the god has to be real or active. Even if it's just a mechanical process, there's still the subconscious sense that Indy has disrespected the temple's rules, which is a sacrilegious thing to do. Also, it should be pointed out that the Indiana Jones series plays pretty fast and loose with the concept of "real" religion. After all, the Sankara Stones' power points to the "reality" of the Hindu (?) 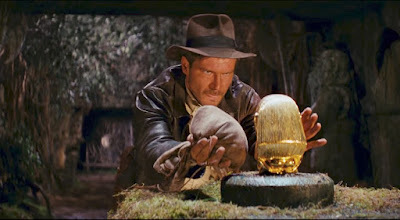 religion in Temple of Doom, and I think some Christians might object to the Ark of the Covenant still having power in the face of the "reality" of their religion, as proved by The Last Crusade. Obviously none of that is in Raiders, but I think it points to Lucas/Spielberg's general conflation of "religion" with "magic", which could make the god(s) in the temple just as "real" as the Jewish god who smites the Nazis at the end. Hell, even in the Hebrew Scriptures, the pharaoh's god is able to turn those staffs into snakes, so it's not even a monotheistic religion so much as "There's only one god you should actually worship." To blather on about Raiders, the whole opening sequence also establishes the tone brilliantly. Indy's first seen from behind, a figure in complete control. He knows where he's going, he understands the significance of the dart in the tree, he's unfazed by a man pointing a gun at him, he even knows to gather up a bag of sand to prepare for a trap. On the way to the idol room, he passes the corpse of his rival, showing that Indy (a) has rivals and (b) he's better than them. Everything pivots after one mistake: when the idol-for-sandbag switch fails. From then on, things keep getting worse. Poison darts fly at him; his guide turns on him; his leap across a pit falls short; the root he grabs to stop his fall comes loose; he’s chased by a giant cartoony boulder; he ends up on the bad end of dozens of angry Hovitos; he escapes them by running like hell and climbs into a plane piloted by a goofball; he freaks out about a snake in the plane. The character who began as a shadowy figure utterly in control despite dangerous circumstances ends up stripped of his prize, soaking wet, and screaming his hatred for a man’s pet snake. We see that Indy’s a skilled, intelligent, capable man. Then he made a mistake. A mistake anyone could make - how could he know how much the idol would weigh? The thing is, he was smart enough to prepare for the trap itself. But still, he’s not perfect. Then as things skid farther and farther into crazytown, he continues to demonstrate skill, bravery, and smarts, but they aren’t enough. By the end of the opening, we understand that Indiana Jones is smart, brave, tough, and in over his head. And it’s going to be fun to watch.